The Tips to Teach Basic Rudiments Online Mini-Course ($60 Value) is a FREE Teacher Training Course. Each of the 12 Videos highlights one music theory concept from each of the 12 Lessons in the Basic Rudiments Workbook. This Mini-Course contains quick Teaching Tips to Supercharge Your Class! The Music Theory Video Lessons, taught by Glory St. Germain, outline key concepts presented in each of the 12 Lessons in the Basic Rudiments Workbook. The FREE Tips to Teach Basic Rudiments Online Mini-Course is a FREE Teacher Training Course. Each of the 12 Videos highlights one music theory concept from each of the 12 Lessons in the Basic Rudiments Workbook. This Mini-Course contains quick Teaching Tips to Supercharge Your Class! In each of the Music Theory Video Lessons 1 - 12, you will learn teaching tips and short cuts in presenting concepts to your students. Get the Basic Rudiments Workbook and Answer Book to follow along with each of the 12 Music Theory Video Lessons. 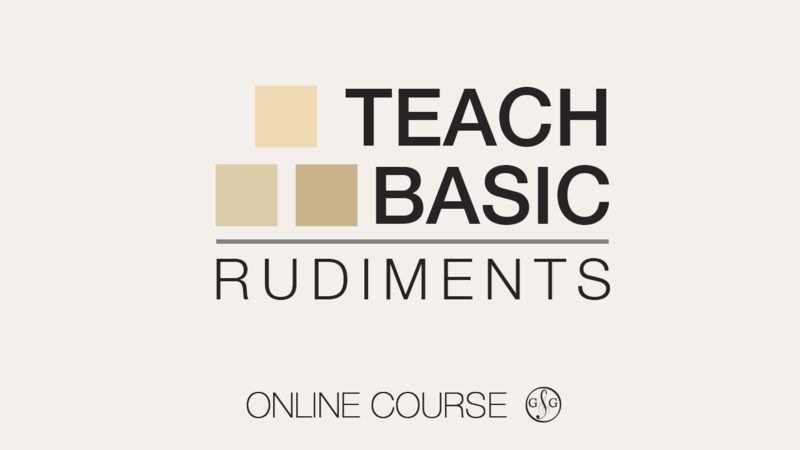 The Teach Basic Rudiments Mini-Course includes 12 Video Sessions on how to simplify complex concepts in each of the 12 Lessons in Basic Workbook. Plus, in Session 1 you can download your Free eBook gift entitled: "3 Effective Ways to Teach Students in their Own learning Style". In each of the Music Theory Video Lessons 1 – 12, you will learn teaching tips and short cuts in presenting concepts to your students. Easy Memory Joggers for Learning the "Accidental Triad Salute"
How to Create the UMT Map and Score 100% on Theory Exams! Music Theory Video Lessons #1: Ledger Lines. You will learn how to teach the landmark note patterns including ledger lines and their association to the keys on the keyboard. Music Theory Video Lessons #2: Accidentals. You will learn how to teach the rules about accidentals: where they go, what they do, and why we need them. Plus you will learn how to use the keyboard as a visual aid in identifying pitch for a chromatic half step (semitone). Music Theory Video Lessons #3: Diatonic Half Step. You will learn how to teach the chromatic and diatonic half step (semitone), whole step (whole tone) and enharmonic equivalent. Music Theory Video Lessons #4: Circle of Fifths. You will learn how to teach half steps (semitones) and whole steps (whole tones also called tones) to form the Major scale pattern. Plus, discover the short cut on how to write the Major keys around the outside of the Circle of Fifths in less than one minute. Music Theory Video Lessons #5: Intervals. You will learn how to teach Harmonic and Melodic intervals. And, using the Circle of Fifths, learn how to identify Major, minor and Perfect intervals. Music Theory Video Lessons #6: Minor Scales. You will learn how to add the relative minor keys to the Circle of Fifths. Explore Memory Joggers for teaching the Natural, Harmonic and Melodic minor scales. Music Theory Video Lessons #7: Major Triads. You will learn how to teach writing triads in Major and minor keys. You’ll also learn the “Accidental Triad Salute”. Music Theory Video Lessons #8: Rhythm. You will learn how to teach the innovative UMT symbols that make adding rests to rhythm questions easy in Simple Time. We’ll discover when a whole rest fills a whole measure and when it doesn’t. Music Theory Video Lessons #9: Identify Melody Key. You will learn how to teach identifying the key of a melody as Major or minor. Discover how to use the UMT Guide to prepare for review tests. Music Theory Video Lessons #10: Transposing. You will learn how to teach the Tips for Transposing Up or Down one octave. PLUS, learn how to use the UMT Chart in preparing for tests. Music Theory Video Lessons #11: Music Analysis. You will learn why we study theory and how it can help us develop strong sight reading and ear training skills. Music Theory Video Lessons #12: Musical Terms. You will learn how to create the UMT MAP that will help your students score over 90% on their FINAL examination.